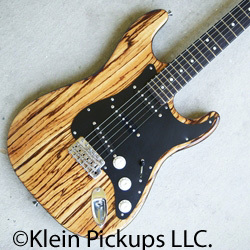 Custom Wound Pickups for Stratocaster Guitars: Add this product to your shopping cart, then add your specifications and customizations. If you are unsure about your specifications please consult us. We strive to make the best pickup that will suit exactly to your needs. Looking for high output? 8-9K? How about low output? 3-4k? We use 3 different forms of magnet wire and 4 different grades of magnets. Add a Strat bridgeplate to compress your bridge signal and make it more useful. Be sure to enter your contact information correctly. You will not be charged until your specifications are agreed upon. Lookingfor something specific? More Mid Range? Less Mid Range? Punchy,quick attack? Smooth Compression? These plus many many more optionsare available. *Bridgeplate Not Included, Sold separately on the Guitar Parts Page.